LA MESA, Calif. (KGTV) - Outrage is growing in La Mesa after a vandal was caught hacking away at a piece of history. In the heart of La Mesa is a trip into history aboard a wooden railroad depot built in 1894. 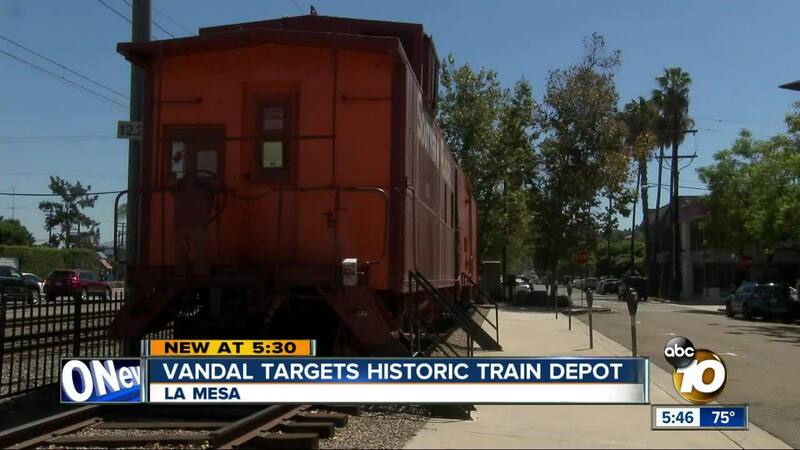 "The La Mesa Depot is La Mesa's oldest building in its original form," said Donna Spevack, Administrator of Fund Development for the Pacific Southwest Railway Museum. Inside the depot is an original telegraph, clock, typewriter and ticket window. "The depot was originally built to send telegraphs and for people to purchase tickets to Campo, Tijuana and back through San Diego," said Spevack. The depot closed up after half a century. Eventually it was restored and reopened as part of a railroad museum run by a nonprofit, Pacific Southwest Railway Museum. "Always try to keep it looking nice to preserve it for future generations," said Spevack. The mission that just took a hit - actually a lot of them. "It's heartbreaking to see people would come by and do this," said Spevack. Spevack says recently, police caught a man one evening hacking away at the building with a hammer and arrested him. His motive is unknown. 10news followed Spevack as she got her first look at all of the damage, which went all around the building. Around the locomotive, there is more damage. Wood chips were discovered hammered off. They haven't gotten any estimates yet, but it won't be simple. "It's going to be hard to match everything perfectly and restore it to its original historic state," said Spevack. A meet-and-greet coffee fundraiser will be held at the La Mesa Depot to help with repairs at 8 a.m. on September 25th.